Do you know if you are eating enough? 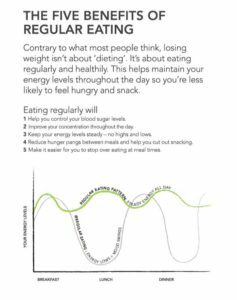 One way to avoid binge urges is to ensure that you eat enough food. Binges can occur due to under-eating over the course of a few days. Most people do not know how much food the average person needs to help them get through the day. In 1993 the FDA was originally going to state that the daily number of recommended calories was 2,350, but then they decided that this number was too much so to make things “simpler” they adjusted it to 2000 calories instead. [350 calories is essentially a whole meal or snack]. Most people burn 2000-3000 calories a day. Some people’s body requires more than 2,000 calories a day, which means it is going to be impossible to stop binge eating on 1500 cal per day if your body requires over 2000. If you live in fear of weight gain this should give you a better understanding that your body needs food for nourishment and fuel. You don’t have to eat less. You just have to eat right! You don’t want to just focus on calorie counting. 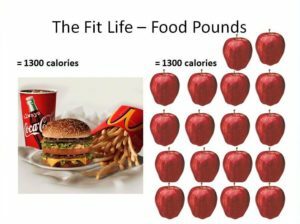 Your focus should be whether or not you’re eating enough nutrient dense foods and eating regularly, every 2 to 3 hours. 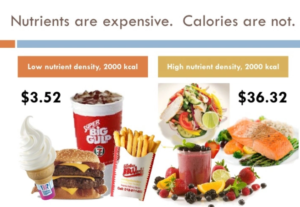 There is a difference between 2,000 calories of nutrient dense calories & 2,000 empty calories [healthy food vs. junk food]. Nutrient–Dense Foods. Nutrient–dense foods contain high levels of nutrients, such as protein, carbohydrates, fats, vitamins, and minerals, but with few calories. These foods provide the most bang for your nutritional buck. They are high-quality and generally are minimally processed. It is imperative that you follow a healthy balanced diet, focused on nutrients and getting the right amount of servings from each food group versus just counting calories. Under-eating is a leading cause of over-eating. Restrictive diets lead to strong urges and cravings that can lead to binges. If you are interested in receiving help on improving your eating habits. I can help you fill the gaps of your nutrition with a nutrition supplement that provides you with the nutrients you need to help combat cravings, increase natural energy and boost your immune system (It can be used as a meal replacement, although it was not designed to be a meal replacement, you also must be sure to spread your nutrition out throughout the day, avoiding going longer than 3 hours between feedings). Using our simple & easy portion control container system is the ideal way to make sure you’re getting the right foods, the right amount of foods and the right amount of nutrients. Contact me for details on how to get your eating on track.